GTbets is a newer entrant on the online sportsbook scene, having opened its doors in 2011. Since that time, it has acted in an honest and aboveboard manner, which puts it among the top sports-betting organizations still serving the U.S. market. Click here to go to GTbets.eu. Suppose you deposit $250 to get the full $250 bonus. Well, you’ll have to collect ($250+$250) * 5 = 2,500 Rollover Points before your wagering is finished. After that point, your bonus will become unrestricted cash, so you’ll be able to withdraw it or keep betting on other events. Looking at the wagering contributions chart, we see that betting on the horses offers the quickest means of earning out your bonus. Because racetrack betting provides 7.5 points for every $10 put at risk, you’ll only need to wager (2,500 / 7.5 * $10) = $3,334 before the money becomes truly yours. On the other hand, casino table games make releasing your bonus a chore because you’d have to bet (2,500 / 1 * $10) = $25,000 to unlock the whole bonus. Most sports-bettors will have to put in (2,500 / 5 * $10) = $5,000 of action before they’ve fulfilled the playthrough obligations of the GTbets MAXBONUS offer. 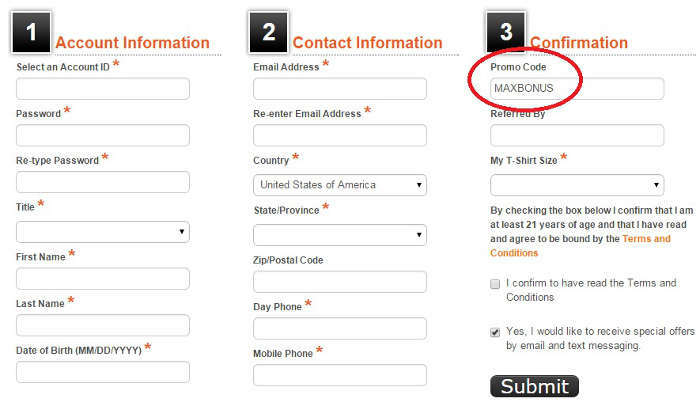 The MAXBONUS promo code applies solely to deposits in the $35 to $1,000 range. The 100% up to $250 bonus cannot be claimed by those using Neteller or Skrill to deposit; however, they can still partake in the 50% up to $500 bonus. This offer is only relevant for the first-ever deposit a customer makes at GTbets. Moneyline bets at less than -300 (1.33) will not award any Rollover Points and therefore will not help you meet your bonus wagering obligations. Bets in the casino on Baccarat, Craps and European Roulette using bonus funds are strictly banned, and any attempts to play these games with a bonus may lead to a forfeiture of winnings and permanent account closure. Instead of trying to stay on top of an ever-moving promotional schedule, you can relax because GTbets will let you know of any reloads that you’re entitled to. Simply sign into your account and click on the Bonus Alert. You’ll see a personally tailored bonus offer of between 5% and 50% on your next deposit. The rollover requirements for each reload may change depending on the offer, but you’ll be able to check out what they are before accepting any bonus. You’ll get a free half point on every contest involving your chosen teams! This means that if the normal line would be -3 (-110), you’ll get it at -2.5 (-110) instead. Now, you have every incentive to actually bet on the squad you’re a fan of rather than putting action on teams that don’t really interest you. Select your favorite teams carefully because once you do so, you won’t be able to change them until the end of the season. The Favorite Teams special lines only apply to full-game straight wagering on sides. No parleys, teasers, half-time results or total points bets will feature the adjusted odds provided under the provisions of this promotion. If you refer someone to GTbets, and they make a deposit, then you’ll get a 50% bonus on the size of their deposit. This offer caps out at a respectable $400 maximum. To request a cashout of these funds, you’ll have to earn 5 times the bonus amount in Rollover Points. You must have previously made a deposit yourself in order to receive the Refer a Friend bonus. At the same time that you earn Rollover Points, you’ll also collect points for the Game Time Rewards program. The rate at which you collect these points is determined by the types of bets you make and your level in the system. Racetrack bets reward you the most while wagers on table games in the casino will grant the least points. Your position in Game Time Rewards is determined by your total lifetime points earned. All bettors start at Silver, but they can advance to Gold after 20,000 points. Whoever amasses 200,000 points over the life of their account will be placed in Platinum, the highest tier. Trade in your points for a Kindle, PS4, DVDs, sweepstakes entries, cash and other prizes. Check out the Game Time promos that will award you double points for certain wagering activities at specified times. GTbets lists more than 90 racetracks that are available for betting. Most of them are North American venues that conform to the parimutuel betting system, but a few international, fixed-odds races are offered from time to time. Make your choices to Win, Show or Place, or explore the myriad possibilities of the Daily Double, Superfecta and other exotic bet types. On the first day of every month, you’ll receive a 15% rebate on your horseracing losses from the previous month. This doesn’t include futures, props, fixed-odds markets, matchups or weekly contests. Bonuses, rebates and other free money added to your account will not factor into the calculations for determining your rebate amount. 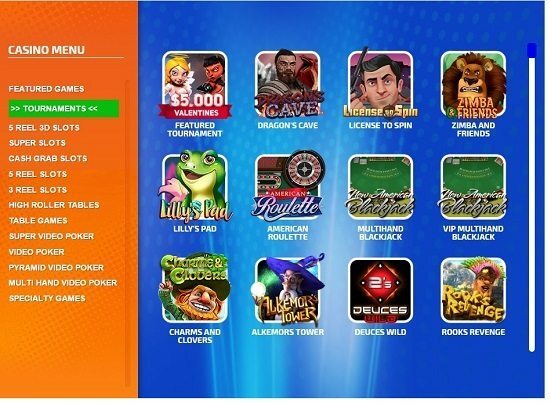 Within the GTBets Casino, you’ll encounter more than 100 slot machines, video poker, blackjack, roulette and all the other table games you’d expect. There’s also a schedule of frequent tournaments, including daily freerolls. Every week on Tuesday, casino players will receive a 10% rebate on their losses from the previous week. Note that any bonuses or other promotional funds that you earn will be deducted from your total loss for the purposes of calculating the rebate to which you’re entitled. 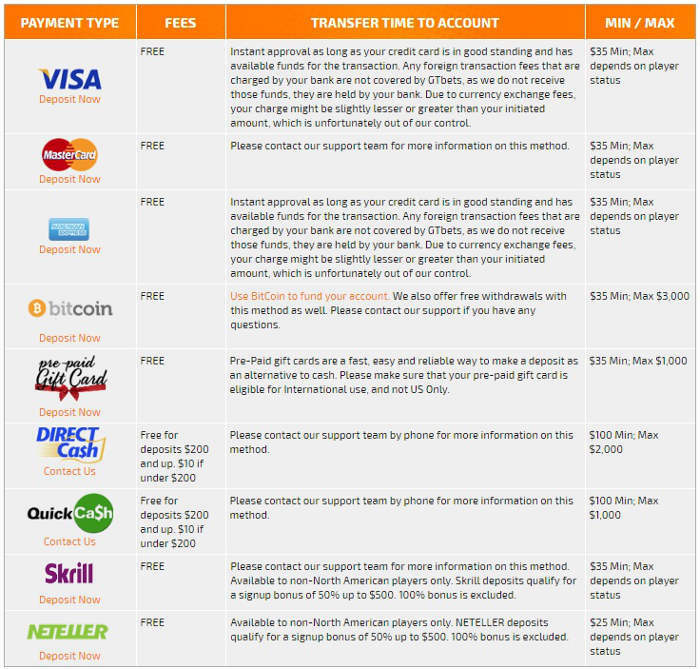 Deposit options at GTbets include credit cards, Bitcoin, Direct Cash and Quick Cash. Players outside the United States can additionally fund their accounts with Neteller and Skrill. Direct Cash and Quick Cash incur fees of $10 for deposits of less than $200, but all other deposits are free of charge. Minimum deposits are $35 for most methods. When it’s time to request a payout, you’ll be restricted to Bank Wire for your first two withdrawals if you made your first deposit with a credit card. This will incur a $60 fee each time, so we recommend transacting through the Bitcoin network instead. Every customer can get a free Bitcoin cashout of between $300 and $3,000 once during a 30-day rolling period. Further BTC withdrawals within the 30-day timeframe will incur fees of 5% of the withdrawn sum. Direct Cash and Quick Cash are also available for payouts, but they have fees of at least $50 and they can’t be used by credit card depositors for their first or second withdrawals. All things considered, Bitcoin represents the best balance between convenience, processing speed and cost. The cryptocurrency has been gaining traction in recent years and is rapidly becoming a standard element of the online financial landscape. Whether you have an iPhone, iPad, tablet, Windows Phone or some other type of mobile hardware, you’ll be able to access the full sportsbook from your device. This includes the ability to make a deposit or withdrawal right from the palm of your hand. As far as the casino goes, the functionality is a bit more limited because certain games weren’t designed for mobile. Nevertheless, there is a selection of popular casino titles available for mobile play. GTbets boast a large lineup of NFL lines as well as a full complement of other sporting contests with large American audiences. Pickings are a bit more slim for events that have traditionally centered around other parts of the world. An exception is soccer where you’ll find English Premier League, Bundesliga, Primera Division and other top-tier leagues heavily covered. You can wager up to $5,000 on final sides for NFL and NBA contests and $3,000 on halftime sides for either sport. For NCAA football and basketball, the limit is $3,000 on both halftime and fulltime sides. Other types of wagers can only be bet for up to $500, $1,000 or $2,000 depending on the specific bet being made. In NHL, the max is $2,000 on a side while it’s $3,000 in MLB. Other baseball and hockey bets are restricted to $1,000 or $500. Other sports cannot be wagered on for more than $1,000 or $500 at a time either. In keeping with industry developments, GTbets has inaugurated a live wagering section of its website. This allows visitors to put more money on the line even while a sports competition is underway. Unfortunately, the book tends to take more juice from these wagers than is standard, so if live betting is your specialty, you might want to look somewhere else. 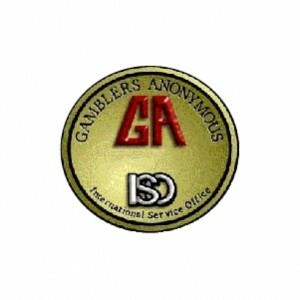 GTbets is pleased to welcome players from most countries, including the United States. However, there is a list of jurisdictions from which the firm doesn’t accept bets. They are Israel, Russia, Belarus, Great Britain, The Netherlands, The Netherlands Antilles, Aruba, Canada, Chad, Cuba, Denmark, France, Haiti, Iran, Iraq, North Korea, Myanmar, Serbia, Sierra Leone, Somalia, Syria, Sudan, Suriname and Libya. Within the U.S., there are a few areas that are unable to wager at GTbets: D.C., Kentucky, Louisiana, Maryland, Missouri, New York, Oregon and Washington. Get a $250 sports bonus! Find the latest GTBets promo codes here.